With all the new types of media, tools and media platforms that I have been learning to navigate lately, quite apart from figuring out how to build and drive a blog, many mountains have been climbed technologically and a pat on the back is possibly well-deserved now. Perhaps a different computer for each different role would be a good idea, simplify things… Changing hats is not as cut and dried as I had hoped it might be, when all written work is conducted from one space, and my computer’s desktop is proving far too small! What I could do with, rather urgently, is a spacious physical office working space, light and airy and organised, with paperwork filed and easily accessible … and an assistant or two … but that is a dream and that story is for another day. Besides writing and honing new communication techniques, one of the recent skills that I have (partly) collected in my ‘tool bag’ of experience over the past few years, is learning to read / understand Nature in the northern hemisphere, to figure out what to do in the garden during the British Winter. One of the greatest challenges for me in living here, apart from actually going outdoors in the cold, has been that the weather on many days is utterly temperamental (at least it is so, where we live). This changeable climate is something that I find immensely confusing, and aggravating, but I am learning to make the most of the ‘now’, to grab opportunities when they present themselves, to go with the flow even more than ever … just to get through changeable days feeling sane! Unusually, this week has been fairly stable where we live and, thankfully, there have been days which one can only describe as divine. Yesterday the sun shone for as long as it was able to, bathing us in glorious Mid Winter brightness, beckoning me to abandon writing, go outside and make the most of the light. Today, the day ended on the same note: bright, and crisp, calm and ‘even’. These moments make life in the British countryside worthwhile. As part of my newfound repertoire of ‘skills’, this sixth Winter in our current home has seen me supervising and half-confidently mastering a few tasks outdoors, tasks in conditions that I have never had to deal with before, braving the cold when the weather and my energy levels work in tandem, which happens every now and then. In late 2009 we took on a very overgrown garden, with little (or no) knowledge of British gardening ways, and it has been a slow process learning how to manage everything on our acre. Declaring the property ‘organic’ upon arrival, has given me ample excuse, if excuses were needed, to let things run wild and free, while I found my way. Luckily, some clarity has come with time, and my latest task has been to gradually prune back hugely rambling roses, and unveil several holly trees growing near the house, something that has felt personally symbolic too. Once trimmed, by my occasional and very treasured garden helper (when I can stretch to afford his help), I set to tackling the piles of trimmings with my shredding machine, and turn the prunings into the most beautiful organic mulch or material for compost. Yesterday was one such perfect occasion … We worked together in the freezing cold, cheered by the light of weather termed by the treasured local chap as “mild”, followed by my delightedly spreading gorgeous shredded material over areas of bare soil, tenderly covering the soil with a natural blanket. The holly and rose prunings did us proud, and there was something deeply satisfying about the entire process. I shall leave you to ponder that, as I do. 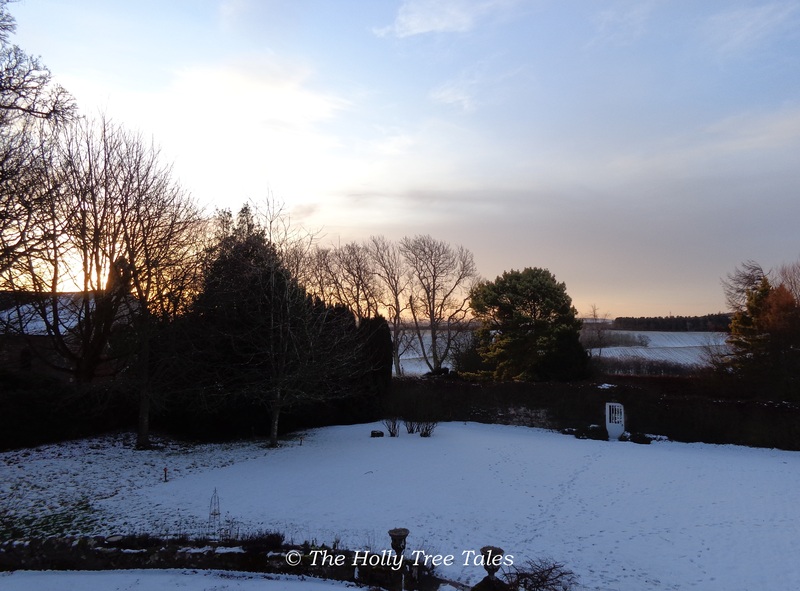 Southerly views of morning light, across a bright snowscape.